The heart is about the size of and adult clenched fist and sits in the chest cavity between your two lungs. Its walls are made up of muscle that squeezes or pumps blood out each beats. Breathing introduces Fresh, oxygen-rich air and the lungs are responsible for delivering the oxygen to the blood whilst the heart circulates it through the lungs and then out to the different parts of the body. The heart has four chambers, imagine a ‘two up two down’ home, a room upstairs and downstairs to the right and a left, separated from each other by a partition wall known as a septum. Each “floor” is subdivided into an upper and a lower chamber. The upper chamber is known as the atrium and the lower chamber is known as the ventricle . The right atrium (RA) is on top of the right ventricle (RV) on the right side of the heart – the left atrium (LA) is atop the left ventricle (LV) on the left side. It is the right side of the heart (RA and RV) that is responsible for pumping blood to the lungs, and indeed where the blood cells pick up fresh oxygen. This oxygenated blood is pumped to the left side of the heart (LA and LV) and consequently pumped to the rest of the body. The cells in the body use oxygen from the blood, and the de-oxygenated blood is returned to the RA once more. This journey is known as the circulation of blood. The diagram demonstrates the four chambers. You can see there is an opening between the right atrium (RA) and the right ventricle (RV). This is a valve known as the tricuspid valve, made of three flexible thin leaflets that open and shut like a valve serving as a one-way door allowing blood to move only in one direction – from RA to RV. On the other side the mitral valve allows blood to flow only in one direction from the LA to the LV and unlike the tricuspid valve it only has two leaflets. 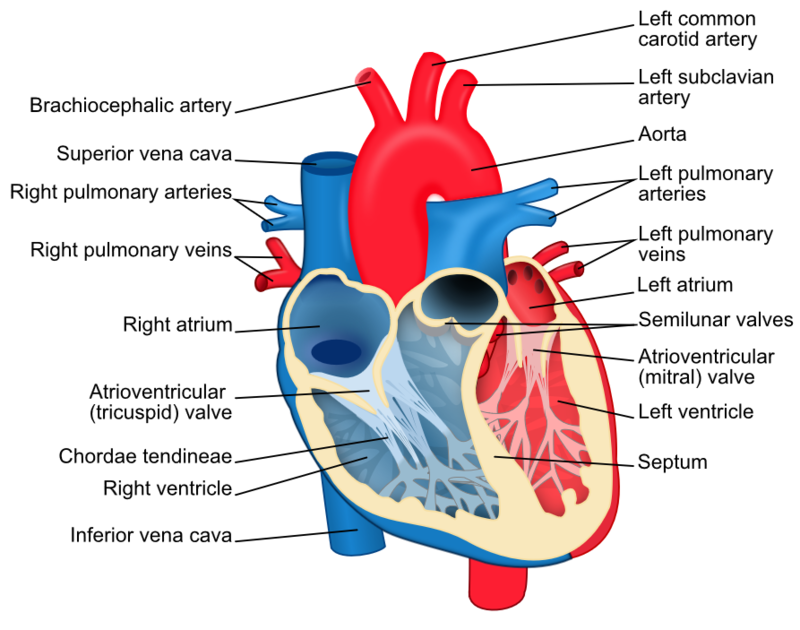 Notice the thin strands attached to the edges of the mitral and tricuspid valves, these strings are known as chordae tendineae they connect the edges of the tricuspid and mitral valves to muscle bands or papillary muscles, thesemuscles are the mechanisms to keep the valve leaflets from flopping back into the atrium. Think of a sailing boat and ropes attached to the sail allowing the sail to bulge outwards in the direction of the wind but preventing them from flapping bout in the breeze. So, they allow the valve to open and shut in one direction but not beyond a given point. Oxygen-poor blood at the top of the body; the head, neck and arms, returns to the right atrium (RA) via the superior vena cava or SVC. Oxygen-poor blood at the lower portion of the body returns up to the RA via the inferior vena cava or IVC. When the RA is full, it contracts and builds up pressure which pushes the tricuspid valve open. Blood then rushes from the RA into the right ventricle (RV) and when the RV is full, the walls of the ventricle begin to contract and the pressure within the RV rises, that causes increased pressure and shuts the tricuspid valve so blood is pumped into the pulmonary artery through the pulmonic valve. The pulmonic valve is made up of three flexible cups that are designed to hold blood. When the pressure in the right ventricle is low, such as when the RV is filling up , the blood starts to move away from the lungs towards the RV. When the three cups of the pulmonic valve fill are full of blood, their sides will touch each other, effectively shutting the valve. Therefore no blood leaks from the pulmonary artery into the right ventricle while the RV is filling. When the RV contracts to empty of blood, the pressure within rises above that of the pulmonary artery which in turn forces the three cups of the pulmonic valve to open and blood rushes through the pulmonary artery towards the lungs, where the red blood cells pick up oxygen. The blood is then oxygenated coming from the lungs and returns to the left atrium (LA) via four tubes called pulmonary veins, each draining a separate portion of the lungs. The pulmonary veins empty into the back portion of the LA until it is completely filled, then it contracts. The mitral valve will now open and blood is sent into the left ventricle (LV) when that is completely full, it starts to empty. This increases pressure within the chamber, shuts the mitral valve and opens the aortic valve. This sequence is not dissimilar to that of the RA, RV and pulmonic valve. The aortic valve also has three cups. The mitral and tricuspid valves open and the aortic and pulmonic valves shut until the ventricles fill with blood. In contrast, the mitral and tricuspid valves shut while the aortic and pulmonic valves open during ventricular contraction. By doing so it ensures that the ventricles are filled to capacity before the ventricles start to pump blood and that the blood flows in only one direction. After leaving the LV, blood now rushes through the aorta which is the main “highway” blood vessel that supplies blood to the head, neck, arms, legs, kidneys, etc.